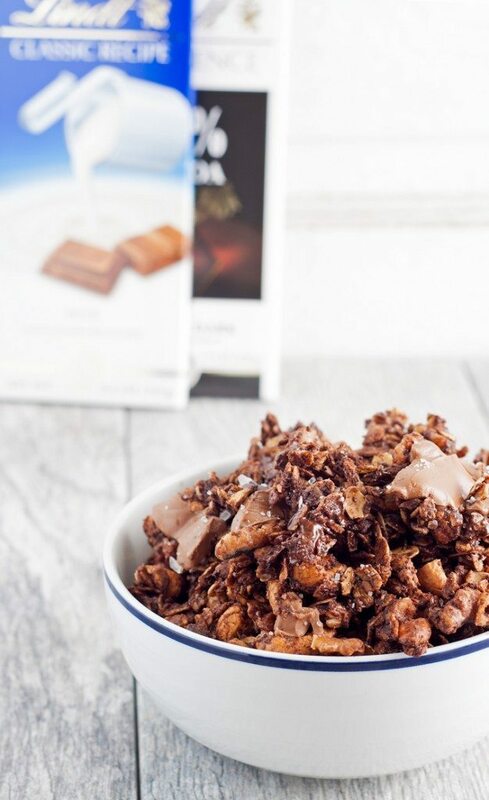 Try this salted chocolate granola when you are looking for a sweet snack or fun dessert! If you’re looking for game day recipes, this sweet treat is perfect. This post is sponsored by Lindt but my love of all things chocolate are my own! Sometimes my sweet tooth and my salty tooth get cravings at the same time. Did you know that there is a salty tooth? Well, I don’t know if there is one “officially” but I can definitely tell you I get salty cravings that are just as serious as my sweet cravings. And my chocolate cravings. 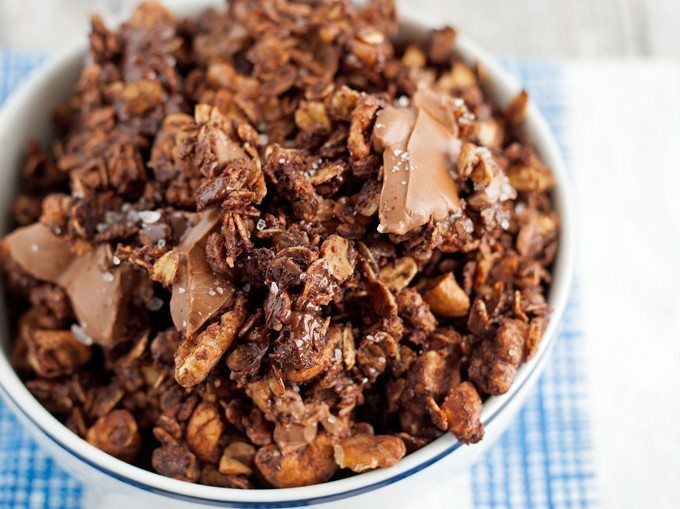 This salted chocolate granola is exactly what you are looking for if all three cravings – sweet, salty and chocolate – hit you at the same time. It doesn’t have to be as tragic as it sounds. In fact, it’s not tragic at all. Because it is DELICIOUS. For my Lindt #Choctoberfest collaboration, I decided to make a yummy granola inspired by a recipe I shared on A Night Owl and a Pinch of Yum recipe. I love me some granola. It’s the combination of crunchy oats and nuts, sweet brown sugar and maple syrup, and kosher salt that will get you every time. Top all of that with the creamy deliciousness of Lindt chocolate and … well… you will no longer think of granola as a boring breakfast food. Nope, this granola could be dessert cause it’s awesome. 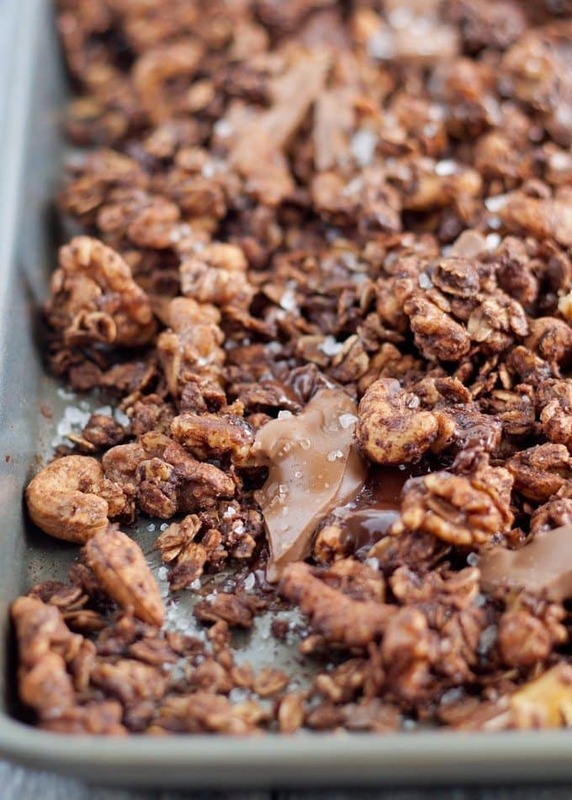 To make this salted chocolate granola, all of your ingredients get mixed together and baked in the oven. Right before the granola is done crisping, remove the pan from the oven and sprinkle your big chunks of chocolate on top. Then, sprinkle sea salt over the chocolate. 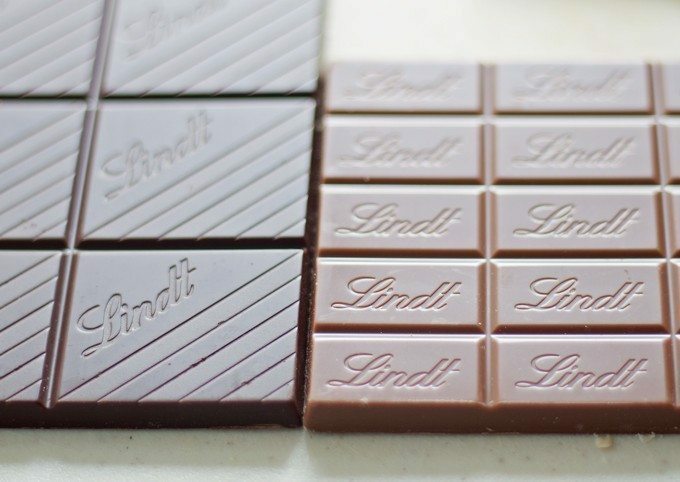 When the Lindt chocolate melts, the sea salt sticks to it. Chocolate + salt = heaven. It should have it’s own emoji. You will be very tempted to try it when you finally take it out of the oven for good. But wait. Let it completely cool because sometimes the chocolate melts all of the way and you want it to re-harden if that happens. Once it is completely cool however… well, dig in. 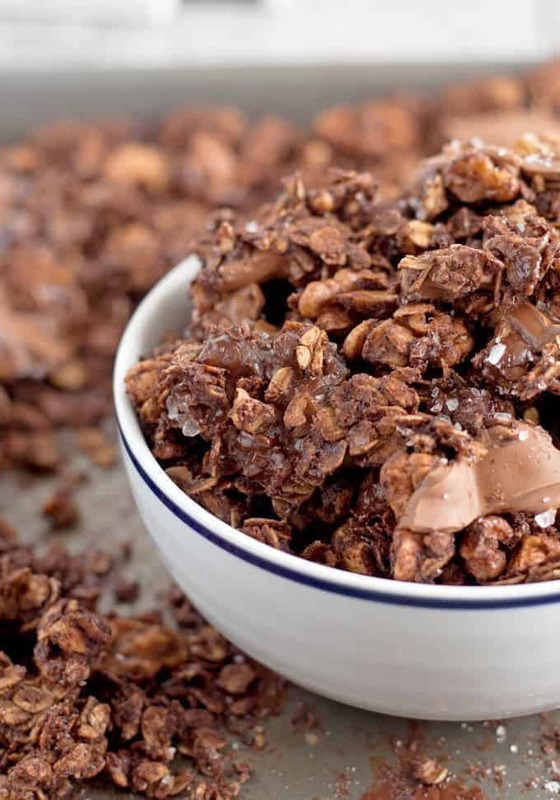 Try this salted chocolate granola when you are looking for a sweet snack or fun dessert! Preheat oven to 250 degrees F. In a large bowl, mix together the rolled oats, wants, cashews, brown sugar, cocoa powder and kosher salt. Set aside. In a small bowl, combine the vegetable oil, maple syrup, and vanilla extract until well mixed. Pour this over the set aside dry ingredients until the dry ingredients are wet. Spread the mixture on a baking sheet and put in the oven. Bake for 1 hour. Halfway through, remove from the oven and stir the mixture to evenly bake. 5 minutes before baking time is over, remove from oven and sprinkle the chocolate chunks evenly over the top of the granola. Sprinkle the sea salt on top of the chocolate and return to the oven. Remove from the oven and allow to completely cool before transferring to a container. We’re giving away chocolate for #Octoberfest – don’t forget to enter! This sounds like the perfect snack when sitting in front of the tv at night. It totally is! Thanks Wendy! I pinned this! It sounds so yummy!! Your chocolate granola looks and sounds so good! 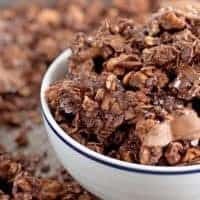 Thanks for sharing this recipe at Cooking and Crafting with J & J.
I love granola too but try to make it Paleo without the oats since they bother my tummy sometimes. I can’t wait to make this and bring some to the gym! I think you should create the emoji for salted chocolate! You would be a millionaire!!!! #Choctoberfest was so fun and I am still weeding through to see all the recipes! Lol, if I could figure out how to make an emoji… oh the emojis I would make!